Still on the hunt for a good sounding system. Two Brothers or Micron? I see many old threads so just curious what you guys think now. I want a nice sound out of the VTwin. Input? 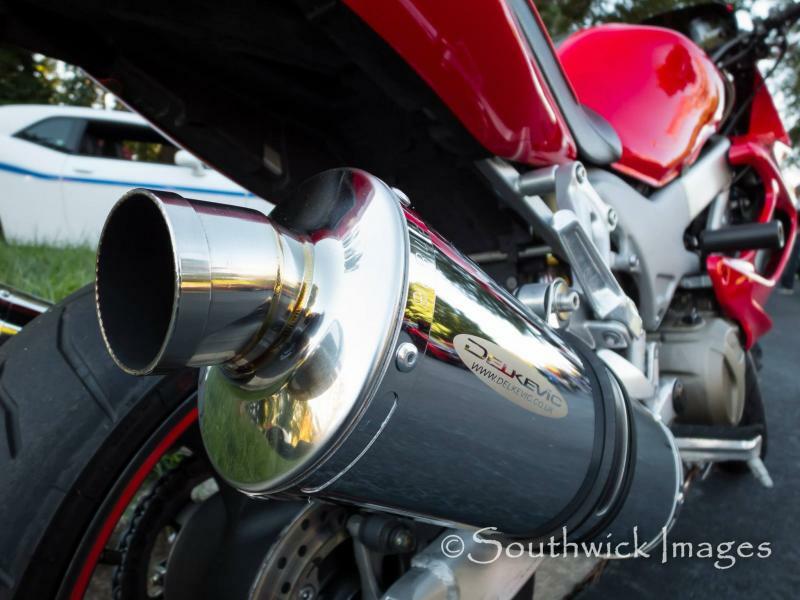 I have a clean pair of Jardine high mounts in the classifieds... As I've always said, while there may be slight variations soundwise between brands it's pretty impossible to make a superhawk sound bad as long as both cylinders are firing when they're supposed to. Alot (not all but alot) of it may boil down to looks for alot of people, and "nice sound" is completely subjective. Fart pipes on a corolla or drag pipes on my neighbors Yamaha have a "nice sound" to their owners (but no one else). But again Honda hit a home run with the superhawk-they sound awesome. I've heard both TBR's and Micron's and they both have a nice deep sound-if it's all about the sound you won't go wrong with either one. Last edited by captainchaos; 10-09-2014 at 09:58 PM. Yes don't want the ridiculous loud "Fart Cans". I saw those I wish those were low mount. I may consider those if I don't find anything else as it looks like you can still keep foot pegs with your setup correct? Are those super loud? Last edited by Rican219; 10-09-2014 at 11:15 PM. Yes the spacers and bolts are included-they space the stock footpegs out a little wider so they clear the mufflers. If all you're used to are stock cans then yes they're going to sound loud. But I also once went from D&D's to these a few years back and was immediately shifting 1k rpm higher all the time around town because they were considerably quietER than the D&D's. Again quieter, not quiet. Never experienced the stock cans as the bike I bought had an after market system but I didn't like it and I bought a low mount system but it's too quiet for me. Supachicken needs to be heard. I had G8 which has a 6.0 LS2 and that's a setup that needs a nice aggressive exhaust tone to compliment the power I see this bike the same way. What brands did you have? I can imagine something with cheap, tiny mufflers like Danmoto is probably downright obnoxiously loud. Only slip ons I ever heard that resembled "quiet" were the Yoshimura street slip ons. Anything else I've ever heard, and over the year I've tried most every exhaust made for this bike, would be classified as some differing degree of "loud." Don't think you'd be unhappy with the way the Jardines sound. Don't think I've ever heard anyone complain about them. Do they sound quite as deep as a set of Devils or Staintunes? Not quite...but they are/were (they stopped making them) also ALOT less expensive and they were always very popular. Last edited by captainchaos; 10-10-2014 at 05:11 AM. Had a Staintuned on when I bought it. Sounded great but that high mount wasn't working with the wife. I went to a low mount Delkevic and it's ok but not Aggressive enough sounding. This is why I was thinking maybe 2 Bros. I'm really looking at your setup now it looks to be in great shape with some minor blemishes. Do you have pics of it on the bike? We can take this conversation offline if you want maybe we can reach an agreement LOL. Rican, I have the exact same exhaust system that captain is offering for sale. It sounds fantastic! When you are just putzing around town, the exhaust is loud, but not too loud, with a nice deep, throaty rumble. But, when you open up the throttle, it gets loud and sounds awesome! The first time I heard it after installing the exhaust on my bike, the sound gave me goose bumps. In the higher RPM's, while at 70% throttle and up, you can hear the muffled crack of each exhaust pulse. Just a fantastic sound. I'm smiling thinking about it. If you are around muscle cars and love the sound of a healthy, large displacement V-8, then you will be very happy with the Jardines. 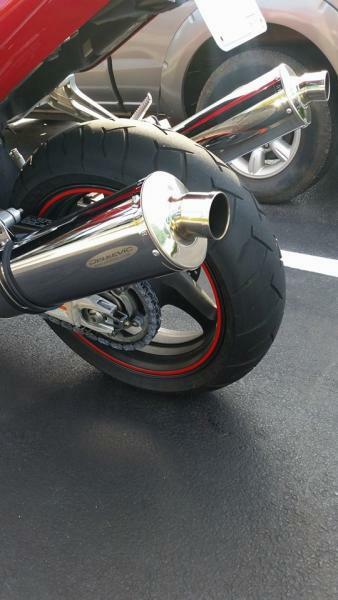 I have heard the Danmoto exhaust, and these are not as loud and as obnoxious as them. The Jardines are a great exhaust. I think they are what a big displacement V-Twin should sound like. I had a member stop by not to long ago, and he had the high mount Jardines as well. They sound awesome coming down the road and just as awesome leaving. So, my thoughts of how this exhaust sounds isn't just from me sitting on the bike or next to it reving the engine. Sweeet! Getting me more pumped up!! Captain lets talk about making a deal sir.